Taiyuan is not only can be a transfer station to other places of Shanxi Province. If your time permits, it is really worth a one-day tour. Rich history endowed Taiyuan with abundant of historical relics, such as Jinci Temple built in North Wei Dynasty which is highlights at Zhou cypresses, Never Aging Spring, and the Lady&apos;s-maid Statue of Song Dynasty;Tianlongshan Grottoes, a good place to appreciate the artistic charm of the Chinese grottos; Longshan Grotto, the biggest and best well-preserved Taoism grotto complex in Yuan Dynasty; the symbols of Taiyuan, Twin Pagoda Temple; Chongshan Temple, which houses a eleven-face Kwan-yin with thousands of hands and eyes, and Shanxi Museum, which exhibits the rare bronze goblets of the Yin Dynasty. 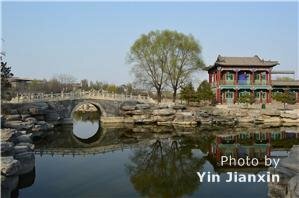 Design Your Own Tour to Taiyuan. The flavor of Taiyuan cuisine is salt and spicy. The style of cooking includes quick-fry, stir-fry, sauté, fry, stew after frying, steam etc. There is an old saying that says, “The most famous wheat food in the world can be tasted in China and the most famous wheat food in China is in Shanxi Province.” Shanxi is famous for the wheat food. It has many styles and a long history. The way of making wheat food is varied. The cooking of sliced noodles places high demands on the chef. The process of making sliced noodles is attractive. The chef will hold a particular shaped cooking knife in front of the big pot which is full of hot water. On his other hand, he will hold a tubular-shaped mass of dough. When slicing the noodles, the noodles will flutter to the pot one by one. The prepared noodles are same in width. Add some vegetables and sauces on the top of noodles; you can enjoy the delicious noodles. The process of making hand-pulled noodles is spectacular. Chef will stretch the noodle from thick dough to very thin strands of noodles. The prepared stretched noodles are smooth, soft and chewy. Served with thick gravy, the noodles taste delicious. The ideal place for eating Taiyuan snacks is located in the Fudong Street (府东街口). There is a famous food street. In addition, there are many famous snacks in the Mishi Street (米市街). For example, there are many kinds of delicious porridges, Chinese Pita Bread (肉夹馍) etc. In the morning, there is local Tounao (头脑,a kind of snack) served in the Qingheyuan restaurant (清和园饭店). Tounao (头脑) has a history of more than 300 years. It is one of the particular Moslem snacks in Shanxi. It is a kind of soup food. In the Tounao, there are junks of mutton, lotus roots and Chinese yam. In addition, the Tounao will be served with yellow wine, distilled grains and some Chinese herb medicine. Visitors can taste the mixture aromas of wine, medicine and mutton. It is delicious and nourishing. In addition, there are other famous Taiyuan snacks such as mutton entrails soup (羊杂碎汤) and stone cake (石头饼). The mutton entrails soup is a common snack in Taiyuan, especially in winter. Chef will put lamb liver, stomach, goat lung, intestine, heart and tendons of mutton etc into a big pot. Then boil them with onions, gingers, corianders, vermicelli and tofu. When the materials are ready, take some materials and soup into a bowl. Then put some corianders, vinegars, salt and red pepper on it, and the soup is served. The process of making stone cake is unique. Chef will cook the cake on the hot stone. The stone cake tastes crispy and salty.